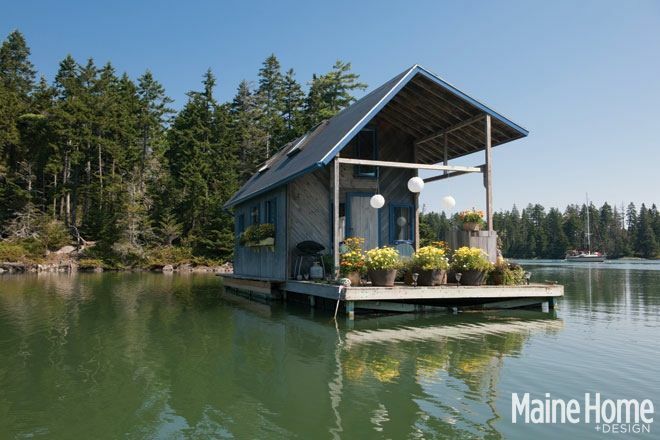 Check out the tiny 240-square-foot floating cottage Foy and Louisa Brown built for themselves in North Haven, an island community in Maine’s Penobscot Bay. It took a decade of nights and weekends to build but was finished in time for their honeymoon. Now it’s a relaxing summer retreat for them each year that’s totally off-grid. Two propane tanks power the refrigerator, stove, and provide hot water. At night the only light comes from candles and oil lamps, while solar lights illuminate the platform. Interior walls are mostly pine shiplap, lightly stained and coated with Polyurethane. Louisa painted the floor turquoise. Unfortunately, Maine weather doesn’t allows for houseboat living year-round. During colder months, it’s stored between two piers in North Haven. For more photos and information about their floating home, read the article at Maine Home & Design by Denise Dowling (photography by Nicole Wolf). I love everything about that little floating cottage! What an adorable home. 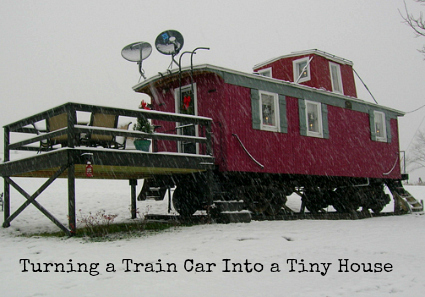 I love to watch the Tiny House television shows, thinking how cute the small spaces are and how wonderful the people are who commit to living in such a tiny home. But I couldn’t do it myself, unless I had to, then of course I would. Lots of square footage is a luxury today but one luxury, for now, that I’m willing to make sacrifices to keep. Ten years is a long time, but wow is it nice! I love the peaceful vibe. They have really done a beautiful job. Not only with the inside but even the outside has “curb” or would that be “shore” appeal !?! I think adjusting to being off the grid could happen pretty quickly in this setting. So cute! I think you could handle being off the grid, Julia, but could we stand you being off the grid? 🙂 We have no cell reception and no internet at our cottage, which people find quite shocking, but it’s actually really nice to unplug and just relax. That looks wonderful. But I have a question. What happens to their waste water? Trying to find the green color on the walls and in stairwell of show “The Fosters.” My wood is the same color as theirs a it looks beautiful! anyone know? I love it! Just got back from a windjammer cruise in Maine (where we were also “unplugged”), and we anchored one night near North Haven. What a gorgeous place. I love everything about this little house.